The 2nd photo exhibit by the Syracuse Photographers Association, of which I am a member and contributor to, starts on Friday, November 20, 2009 with an opening reception attended by the exhibiting photographers from 6 to 8pm. There will be hors d’oeuvres and liquid refreshments served for all who attend. Admission is free! This show features all the photos displayed in matted 16 by 20 inch frames. Most are for sale by the photographers if you are interested and would make wonderful gifts for the upcoming holidays. The show runs from November 20 to January 11, 2010. Click on poster below for a bigger and more readable version. 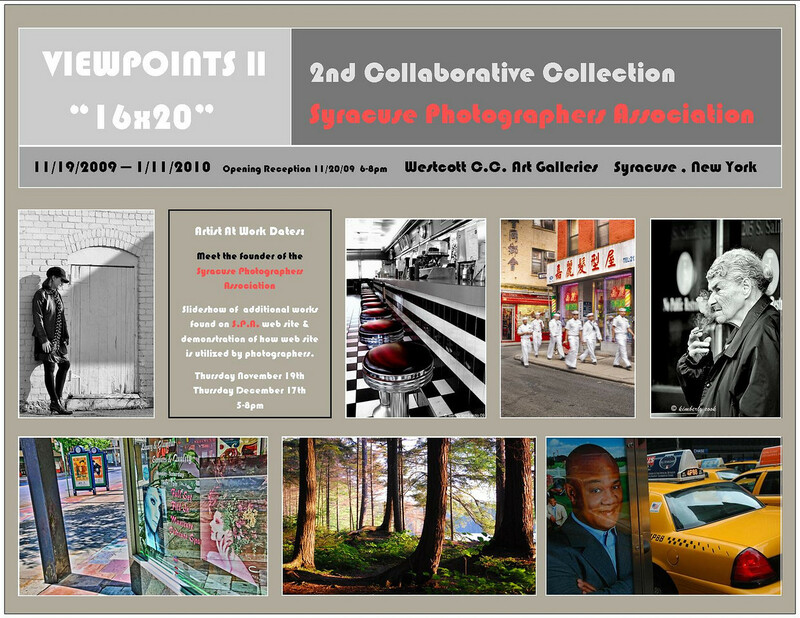 Viewpoints II, an exhibit by the Syracuse Photographers Assoication. This entry was posted in Event and tagged 16x20, exhibit, free, new york, photographs, Photography, reception, show, syracuse, syracuse photographers association, viewpoints ii, westcott. Bookmark the permalink. Do you have an entry? If so, which one? I have three entries in this year’s show. None are on the promotional poster but all have appeared on this blog. I’ll post them hanging in the show after Friday night if you’d like to see them.